I am in process of painting a new 2ftX2ft GLORY Barn Quilt. I am using the same design and color as the 4ft GLORY. Actually I am using a bit of a softer yellow as I am currently painting SUNBURST. This softer yellow make a warmer to the eye color scheme. GLORY has always been a favorite at the shows that I attend. 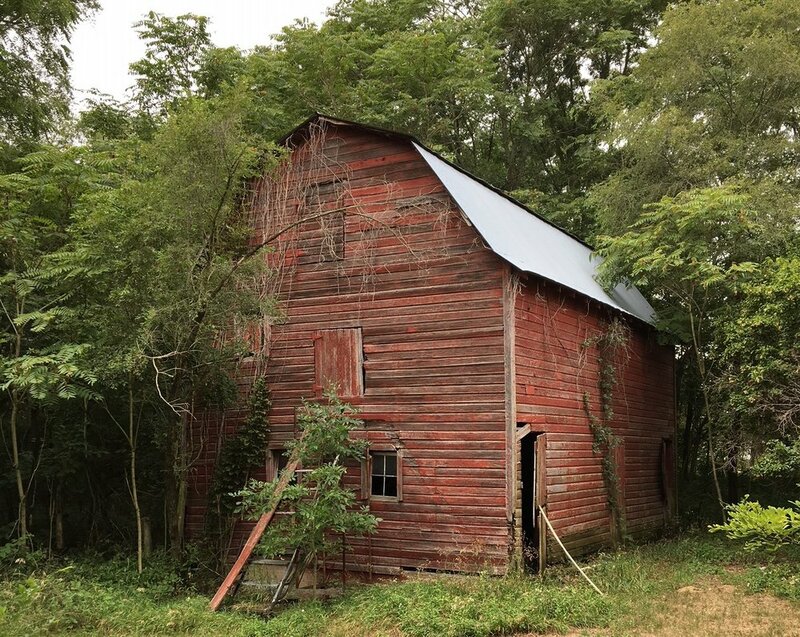 I am also working with a professional photographer to get high quality American Garden Barn Quilt Pics for my website and future products (more to come later - check back for updates). 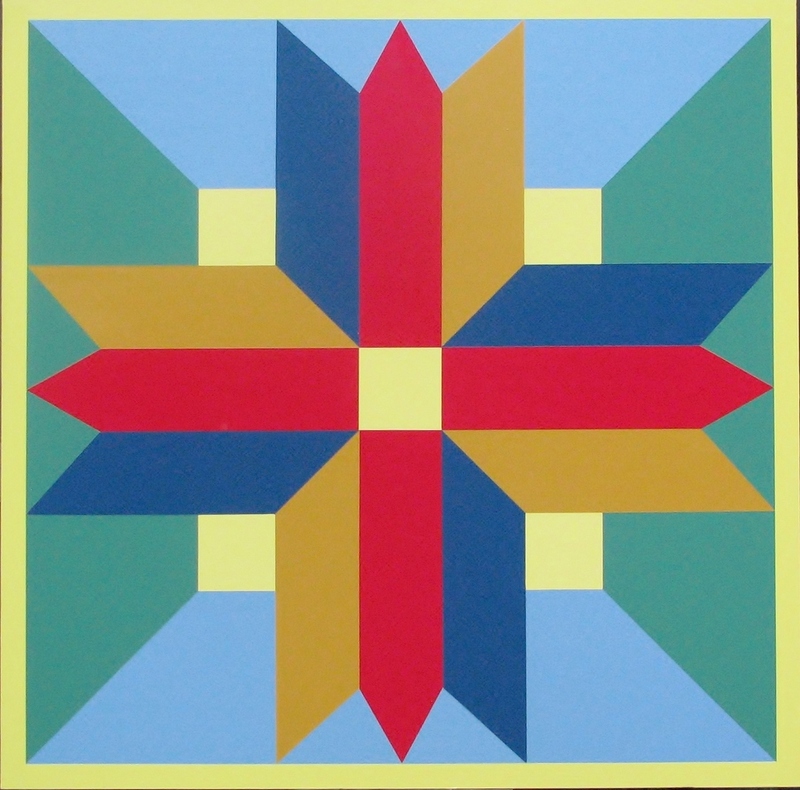 I'm looking forward to improving the presentation of my Barn Quilts in my agbarnquilts/gallery. I will keep you posted a the new pics become availble. 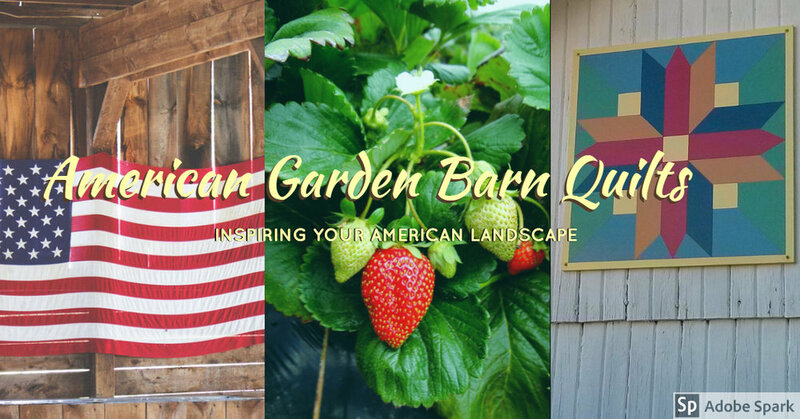 I've designed a new Banner for agbarnquilts.com It incorporates an American Flag Pic, a Garden Pic and my GLORY Barn Quilt from a barn in Seymour IN! In Sept I will be at Hens and Chicks Fall Barn Market in Seymour IN See my Upcoming events link at agbarnquilts.com. Also I will be at the Fort Vallonia Days in Vallonia IN. Oct 21-22. I will be at Hens and Chicks Barn Market in Seymour IN, in a few weeks (see my Events Link) I'm excited to participate for the first time! I have a booth in the "Dairy Barn" I'm also working on a couple new Barn Quilts to display. I also made an 2X2 Luther Rose for the Market as well. To celebrate the 500th Anniversary of the Reformation, I created Luther's Rose 4ftx4ftBarn Quilt for St Paul Clifty Lutheran Church in Columbus, IN. It is a replication of Martin Luther's Original Rose Seal. The Quilt is now displayed in the Fellowhip Area at St Paul Lutheran Church. I look forward to posting a picture after Church on Sunday!! I hope you all enjoy - it was a real blessing to create and I hope the church enjoys Luther's Rose! Mariners Compass 8'x8' Barn Quilt is done! Greetings from the American Garden Barn Quilt paint shop! As an update - the 8 footer is complete. Its Soooo... Big! 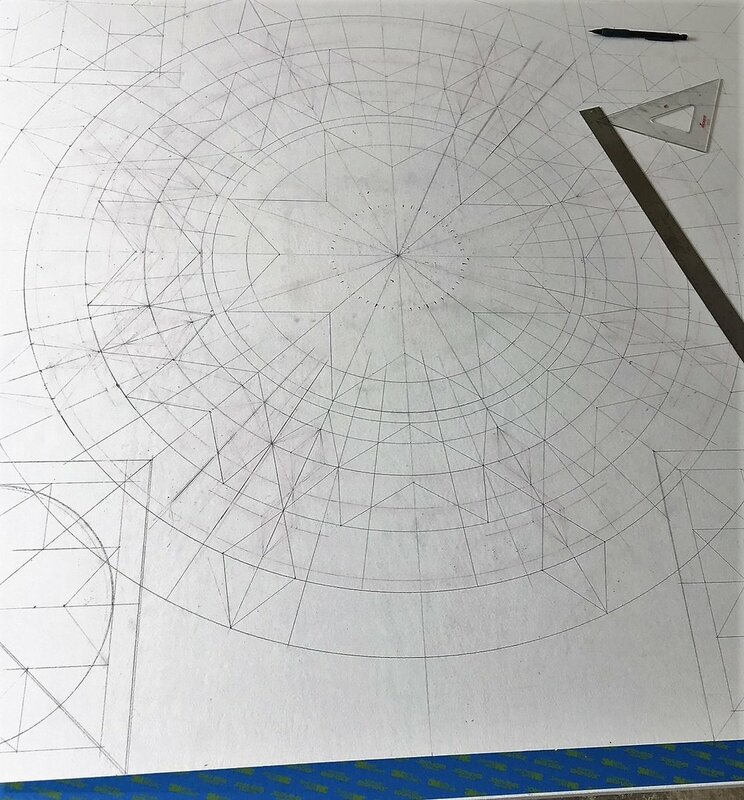 I'm back painting the Mariners Compass 8ft. Barn Quilt. We traveled to Florida to visit our son and his family in April. Then in April and May we traveled to Louisville to visit our oldest son and his wife, and then we have spent a lot of time in northern IN visiting my Father. So now, I'm back at work on the 8 footer. American Garden Barn Quilts, March 2017 - an 8 footer!! As we begin Spring 2017 - I'm taking on my biggest endeavor at American Barn Quilts - an 8 footer !! I have the two 4X8 sheets of MDO and am in process of sealing and priming the sheets. They look massive when laid out side by side. This will be quite an undertaking getting both halves to align in the actual Barn Quilt design. When completed it will be a full 8ft X 8ft American Garden Barn Quilt. Priming the MDO Board for the 8ft er ! Check back for updates !!! I will keep you updated with a few pics of the progress. The Columbus Farmers Market is being scheduled an I plan to have the Barn Quilt completed in May time frame. Oh my......I need long arms !! I am excited to announce that in February, American Garden Barn Quilts is now open for business on ETSY. My Shop name is AGBarnQuilts. You can view and purchase many of my Barn Quits direct from this site. I will continue to add Barn Quilts to my Shop direct to ETSY as they are created. I also have a link to my ETSY Shop on agbarnquits.com / homepage. Loaded into my Shop are "Glory", "Winter Beauty", "Sunny Day's", "Autumn Leaves", "Sunburst", "Mariner's Compass", "Summer Skies", "Lillies", and "American Star". As always, I continue to create custom Barn Quilts as requested.